This article shows how to make a simple extremely light and easy to use no shackle integrated toggle for attaching a halyard to the mainsail. This method works with HM line such as Amsteel. 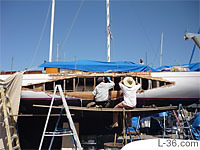 There are several articles elsewhere on the site that show how to make Amsteel to Line halyards. This article is the finishing touch. A 8:1 Vang system that is cheaper than using two fiddle blocks, lighter, and stronger. What is not to like? You just run the control line back to the cockpit where you put a cam cleat. You will likely need a turning block on deck but then you have the vang where you want it when it needs to be released quickly before you round up. The second vang system shown is the 20:1 vang on Papoose. This is a unique system with some advantages that are discussed. This page also has a link to 16 standard variations on vang systems. I am happy to report that the L-36 Eventide returned to the Bay on New Year's Day 2012. After our very well photographed adventures at the 2011 Master Mariners Race I faced a tough decision about whether to restore Eventide. Her hull had basically been sawed through from deck to just above the water line by the other boat's chain link bobstay, and her spruce mast and boom were shattered into multiple pieces beyond repair. Eventide had been so thoroughly restored by her previous owner "Chairman" Bob Griffith and given me so many good times that I decided that if I could find a used and affordable mast and boom that the hull was worth repairing. This winter I am racing on a Tartan-10, not my L-36. We are racing the winter series out of South Beach Yacht Club and another one out of the Golden Gate Yacht Club. The skipper doesn't use a GPS and as I find them indispensable in sailing to a mark and in calling the layline, I brought my wrist version along. But first I needed to program in the waypoints and routes. What a pain. I used OpenCPN and plunked a waypoint down over the marks on the map. Entering the routes was the most difficult. That led me to build the waypoint and route editor. Then I thought, wouldn't it be great to just have a list of all the marks in the area and just check them off, rename them to match the names the race committee uses, import them into a program, copy and paste the race committee routes onto a page and press a button (after a little editing perhaps) and have a file you could download into your GPS? So I built just that. Entering routes into a GPS when you have a number of them to enter is easy with this bulk route editor. 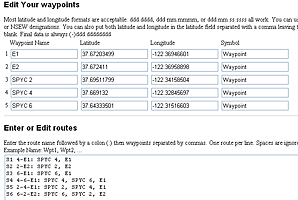 Import waypoints from a gpx file or enter directly into this page, then simply write out the routes all at once and create a custom gpx file with the waypoints and routes ready for export to your gps device or chart program. As an added bonus, Latitude and Longitude can be entered in almost any format, even both in one input box, for ease of copy and paste entry. Convert between different latitude and longitude formats. Then copy and past the converted format into other programs. This program will take most any format as input and outputs the result in five different popular formats. 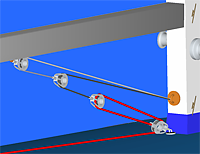 Two ways of reeving the mainsheet in this gross fine mainsheet system are shown. The more obvious way to do it is shown on the right. The problem is that the lines hit each other, the fine control blocks hit the main sheet, and in general it has problems. The other way rotates the main dual block by 90 degrees and has no such interference issues. It also opens up a large space for the fine tackle so that it does not rub on the mainsheet. Using a line shackle and stopper loop you can in some cases eliminate hard shackles even from places that would be impossible to do with normal soft shackles. The stopper loop can be "tied" to the clevis pin and the soft shackle integrated into the line for a clean light installation. I make and use a lot of soft shackles to attach my jib sheets. The normal soft shackle is rather difficult to open and to milk closed. With age, it gets every more difficult to use. The alterniative Kohlhoff style looks a bit insecure although under load it is perfectly secure. This version is a bit of a hybrid with hopefully the best properties of both. The eye is easy to open but can only be opened just enough to fit the stopper knot through it. Almost any slight force will close it quickly. The basic construction is a passthrough eye, a shackle section of about 2 inches, a passthrough lock and then a bury of the other strand into a body section of about 5 1/2 inches, another passthrough and finally a diamond knot. How do we get to the mark fast? When sailing toward the windward mark I always wondered, should I point high, or should I fall off a little for more speed. Some boats are blessed with instruments that give them these answers. They know how high to point and how fast to go to get them to the mark quickly. My boat is simple. I have a hand held wind meter, a knot meter, and a masthead fly. How can I know what the best point of sail is? Try the L-36 Weather and Tide Page Now! Your website is approaching world class. Really Great Job. Been playing with it off and on all week. It's already replaced my usual weather info site. Excellent work. I just wanted to thank you for the terrific weather page. 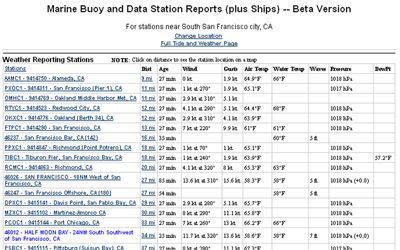 It is my daily go-to page for marine weather. 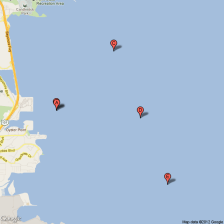 I sail a pair of boats on SF Bay and out of Santa Cruz, and your web site is really extremely handy. It is far better than the "commercial" sites, which is a real tribute given their budgets and what yours probably is. This is the introduction to a series of 6 pages that deal with soft shackles. Step by Step instructions on How to make a soft shackle, some Variations, and some detail on the diamond stopper knot, . . These are incredibly strong. I show how they are used, below. Nothing is useful until it has been tested , so check that page out. There is even a Calculator so you can make them come out the length you want. Enjoy the series. To the left is a picture of the soft shackle on the jib clew. The addition of the Velcro keeps the diamond knot in the center of the clew ring where it will stay out of the way of the rigging. These shackles are very strong. I did some testing and it is clear that the sheet with the eye and the soft shackle is much stronger than the sheet with the bowline. In my testing, the line broke at the bowline. You can follow the links above and see how to make them, as well as the testing that I did. I did the testing at 2/3 scale which is a little less than 1/2 the strength. 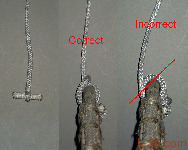 The test at the bottom of the page was done to distruction of a link line made of the same Amsteel thus showing that a soft shackle is stronger than the line it is made from. On the rest of this page, I show how to use a soft shackle.